We're serving up beef, pork, and chicken in this combo plate of a design. Hold the slaw! Get that Barbeque grillmaster in your life something extra special. Nothing says I support you and your obsession with fire and meat more than this whimsical design. 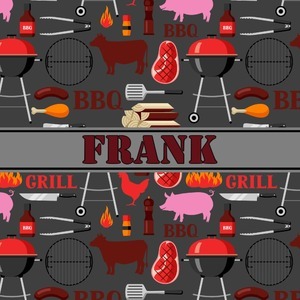 This design features pigs, cows, grills, and more on a simple grey background. There are wonderful contrasting reds, oranges, and charcoals in this macho design. The ribbon across the middle fits your personalization right in the middle. Have fun personalizing this design by changing the ribbon, text, font, or even background! Change whatever you like to really make it fit your personality. If you ever need any help in our design center just give us a call or get on our online chat. We are always happy to help.